...with access to the DOS command prompt commands and the bare minimum set of PowerShell cmdlets. Copy and paste the script below into a text editor and save as say nslookup++.ps1, and run in PowerShell as .\nslookup++.ps1. 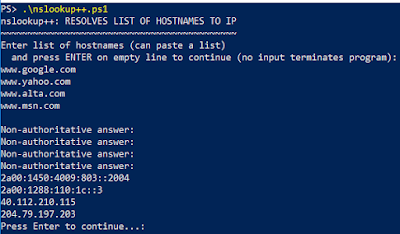 Write-Host "nslookup++: RESOLVES LIST OF HOSTNAMES TO IP"
Write-Host "Enter list of hostnames (can paste a list)"
Write-Host " and press ENTER on empty line to continue (no input terminates program):"